On August 27th, the S&P 500 closed slightly above the 2,000 level. So on a year-to-date basis, the S&P 500 increased about 150 points – or 8% in price only. Most of the return this year has been from the contribution of solid fundamentals in the form of earnings growth versus valuation. As a reminder, the price of any stock or index is the result of both earnings and valuation. Based on this data, valuation has contributed only 36 points (.3 times $120.6) or about 2% of the 8%, and the remaining 116 points, or 6%, has come from earnings growth. In 2013, the S&P 500 increased 422 points or about 30%, with valuation contributing 307 points (2.7 times $113.6) or 22%, and earnings growth adding 115 points or about 8%. Looking forward, there is a good chance earnings growth will continue to be a meaningful contributor to future market appreciation. 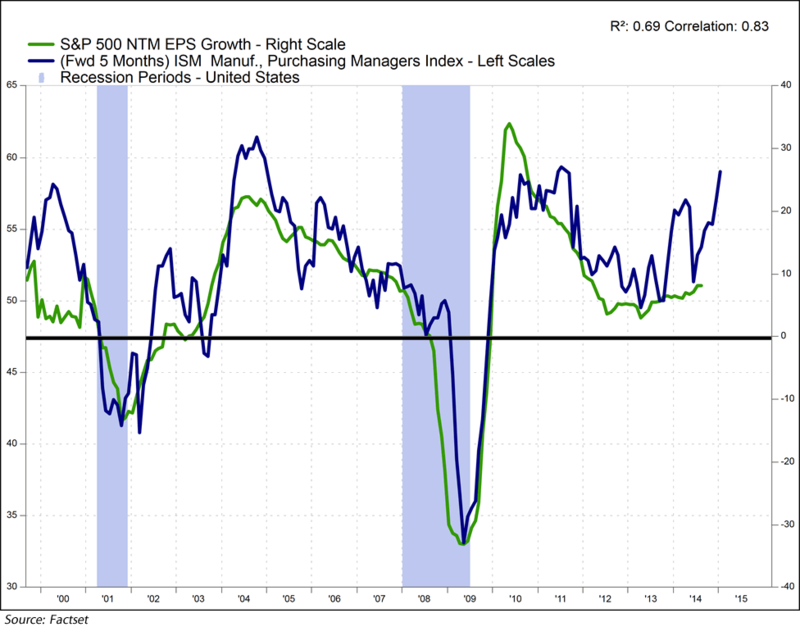 The chart above represents the historical relationship between the ISM Manufacturing index (the blue line) and S&P 500 earnings growth (the green line). Over the last 15 years, the ISM index has been a steady leading indicator (83% correlation) of the trend in S&P 500 earnings growth. With a five month lead, recent ISM index strength suggests earning growth could continue to accelerate. Stronger earnings growth with stable-to-improving valuation (P/E**) would point to further price appreciation in the months ahead. We remain focused on understanding the current trends in fundamentals because it gives us the best probability for investment success. * Earnings are the next twelve months estimates from Factset. ** P/E is the price divided by the next twelve months estimates from Factset.